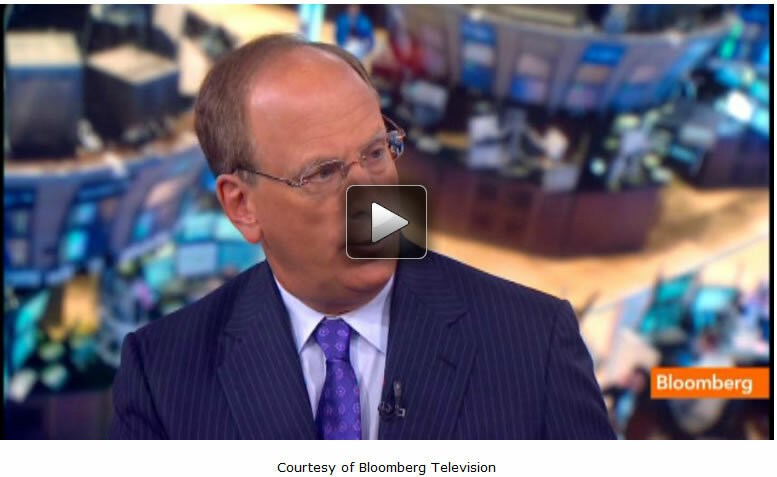 BlackRock CEO Larry Fink joined Bloomberg Television's Erik Schatzker and Sara Eisen on "Market Makers" today and said he does not see any inflationary risk in the United States. Fink went on to say that banks may shrink balance sheets on rules requiring financial companies to have higher capital ratios: "If they shrink their balance sheet, we're going to have a more aggravated problem in the future because banks are the largest owner of U.S. Treasuries." During the hour-long interview, Fink gave insights on China, emerging markets, the bond market, the role the wants BlackRock to play in the market, and his thoughts on Ben Bernanke, Hillary Clinton and President Obama. "In most cases, I am asking them a lot of questions. In terms of regulations and political figures, they're asking me what we are seeing. I think the biggest question being asked today is where interest rates go. Another question is China going? Those of the two biggest uncertainties in the marketplace. It is funny - most people don't ask the question about Europe. Europe is now third or fourth on the list of worries." "Interest rates have backed up about 90 basis points. We have seen a drought on mutual funds in the past few days. We are still at a historical low. This is a problem that I see for bonds. We were at such historical low rates. Normalized rates are higher. Even government estimates for treasuries for 2015 is 5%. We talk about deficits - interest rates over the course of years will be higher...I don't get frightened when you could forecast this out over years. To me, it should not be a shock to anybody. To me, you know, rates are going to go higher. It will be dependent on economic information. So we're going to see a buy toward higher rates...My view is the economy will continue to improve. Implement will continue to improve. Europe is stable in my view. We are going to see a rising interest rate environment." "We need to see earnings for this quarter. It is my view for many reasons that being in equities and the suggested is the right trade. We have seen some very large moves. The long U.S. Treasury Market is down close to 10% year to day. S&P is up 16%. We have had a 26% change in valuation in six months. Obviously, a lot has occurred. For me to tell you equities will rally, I need to be certain that earnings are going to remain strong. From my conversations with many people, I believe earnings are not going to be missing estimates. Earnings will come in by and large bias. We saw that already with Alcoa yesterday. "For those who have the ability to lose equities - I am using that as a mouthpiece to try to have people think about that. Most people cannot do that and most people should not do that. [Insurance Companies] are not allowed to do that. If you compare 1994 to this, it is different. There was much more flexibility. You had a 6% increase in interest rates. Much of the reason why it is muted today, most institutions are inhibited to own equities." "There is going to be a great rotation in bonds. It is going to be within the bond universe. We have been talking to many pension plans, insurance companies to start thinking about moving away from bond funds that are targeted to duration. Most bond funds are core that are targeted to the Berkeley Aggregate Index. The problem of being targeted to this index, we have an aggravated problem, extended duration. At the beginning of the year, it has a duration of 4.8 years of risk. The mortgage prepayment issue that is embedded in the aggregate index is now five and a half years. It is riskier to own that bond fund today that it was in January. We suggest to move to unconstrained bond funds where duration is not targeted to the index." "It is my view that inflation will be very muted. I don't see any inflationary risk at all...I have a different outcome in terms of economic future. I think we are going to be in a two percent or three percent economy. We are going to have improving labor markets. Much as to do with energy in this country where we see a change in manufacturing in this country. We have a huge opportunities for job growth in the manufacture sector." "I think I said that two years ago when I said you should be in 100% equities. It is my strong view that we are going to be in a cycle now whether it is five years or ten years. We are going to have rising rates." "I think the two things that have happened why the statements aggravated the market so much. It is the change of direction. It is the beginning of a major change. We were accustomed to the old. That is upsetting to the world when you have a major policy change. I don't think it will be as bad as people fear. The markets are not giving enough attention to this. I will be very surprised if the Treasury in the next few weeks announces a huge reduction in their need for bond issuance. At the same time, we may see a change in FED policy where they will reduce the amount of bond purchases. At the same time, the Treasury is reducing its issuance. That is not on the market yet. There may be a timeframe for stability. We could see a significant 20% or 30% reduction in treasury instruments. They will announce in the next few weeks or so. The CBO are confirming what other estimates came up with, a reduction. I would have been just as worried if the FED does not slow down purchases as the same time treasury reduces issuance. The FED would then be buying 130% of new issuance. At the same time the FED is changing policies and people started running to reduce exposure in bonds, we have had regulations inhibit and in some cases prohibit activities by the market makers. So the Volcker Rule is inhibiting positioning by broker-dealers of bond holding to capital charges. It makes it even more restrictive for those institutions. If you look at the footings of these market makers their bon holdings are down 70%." "I think it is an intended consequence...What this tells me is there is a faster development for electronic bon trading. We are going to need a vehicle in which there are better exchanges of buyers and sellers. I see this evolving toward an electronic market." "No. There may be but I will not do that. BlackRock will remain percent fiduciary to out clients. If I were a Market Maker, it changes my role with my clients. When we were talking about doing electronic bond trading - we were not going to take any commissions. We found a better solution by partnering with the market and they will do the market maker." "[JPMorgan, Goldman Sachs, Bank of America/Merrill Lynch] will still be committed to that business. They do a very good job. We will like to see 10 more firms be committed as those three firms. That is why we have the shrinkage in inventory and that is why we are experiencing at the moment some stress in the markets of buying and selling bonds, especially corporate bonds." "Basel does not impact government security. Institutions could have leveraged balance sheets and conform. That raises a huge issue. If this goes through, these institutions have two ways to mitigate the problem. They could raise more equity to keep the balance sheet or they are going to have to shrink their balance sheets... The market is very demanding. I would not be surprised that earnings are going to be coming out this week and next where the financial analysts will ask the leaders of these firms what are you going to do about it? Would you shrink your balance sheet or are you going to differ dividend payments? It is either capital or retained earnings or striking the balance sheet. If they balance sheets, we will have a more aggravated problem in the future. Banks are the largest owner of U.S. Treasuries." "The FED has taken their foot off the pedal and buying assets. At the same time, you would have banks also not buying, rolling over into new treasuries. Then we would hope the deficit reduction is larger. We may have an imbalance. This could be another reason for a rise in interest rates...If interest rates go up fast enough and impairs opportunities you have an equity. Equities still present a better risk return." "Role of having cheap labor. As a result, the economy has moved itself to the largest economy in the world. China has done it cheaply on the back of exports to parts of the world. China cannot grow at 8% or 9% when trade partners are growing at zero or two. With the size of the economy, China has to be more dependent on domestic consumption. We are not seeing the increase in consumption domestically to keep the economy growing. The question is, we are seeing a decelerated economy. This has been consequences for an emerging world and other trading partners. I believe there are two structural thing that China needs to address. I believe party leadership has mentioned this so I'm not saying anything that is new. China is living with a one child family policy. Also China has a no safety net for retirement and healthcare. A working couple now with the presumption that the grandparents are alive are caring for them too because there is no safety net...Here we are, two working people trying to help five other people. There is no safety net. What is going on is, their saving more and more and more to prepare themselves for retirement. Demographic issues in China are getting bad. A problem is you're not seeing consumption because people are frightened about the future. They are saving more." "The party is trying to cut that corruption. They are being aggressive with corruption and aggressive with conspicuous consumption. That is another reason why there is slowdown. People are not buying watches and those cars that they were because they don't want to be showing off as much. That is slowing down the economy a little bit. The other issue is we have seen a lot of provincial government building more factories, roads and more things without having necessary demand for that. You have a growing excess of housing and other forms of construction in China. The Central Bank started pulling back liquidity as a warning. You just can't do this once the warning was loudly heard and you had the rates pop up, they reasserted liquidity. I think that they are they're warning banks, slow down. That is another reason why the economy is slowing down." "We may have a slower China economy than people have forecasted. We started the year thinking the economy will be at 7.5% and it may come in at seven percent. I don't think it will penetrate under seven percent." "Turkey has the middle class. You have a very rapid advancement of middle class in the emerging world. Tremendous changes in the demographics of the world in terms of the rise of the middle class. In the last few years, that rise has stopped. Whether it is building better education, better opportunities - they're saying you're supposed to help us rise more. This is very interesting moment in world history that we are not seeing the poor being the protesters. We are seeing the middle-class saying we want more...There is a large population that is still underserved in China, if they don't see advancement in their opportunities." "Absolutely. I don't think you should have an horizon of six months for emerging markets. For long-term investors, I think emerging markets represent value today, emerging world economy markets are cheap but they could get cheaper if there is further weakness." "I was surprised at how negative the market reaction was to the chairman's speech in past meetings. I thought he was very good, very open, very transparent in terms of where the FED Reserve is thinking. I applauded him for what he said. I actually do not think he said as much as the world thought he did. He said there is a change in policy, but he also talked about how we will have a lot of options. If the economy deteriorates, he's adjusted, I would buy more. If the market improves, he would accelerate the slowdown. "I would listen to the chairman more than the other Governors. More importantly, we are talking about tight changes in opinion. We are not talking about that many differences. In reality, if you're a long-term investor, it will not mean that much." "All the candidates are capable. We hear about Janet Yellen and Larry Summers even Tim Geithner. All are confident and capable. I believe [the President] has the good fortune of having choices." "I don't think of myself as a political active CEO. There needs to be more spokespeople for issues like retirement. A big issue on what we do with social security fund, what we do related to the new security laws and how that impacts favors. I am putting myself in a more public position. I do believe there is a role to be played, helping investors and retirements." "I have three years to make that decision. A very interesting candidate." "I am not here to talk about the President."